Previously, on MinerBumping... The New Order's superbly orchestrated gank of a Mackinaw piloted by devinebish resulted in a rant about newbies and player retention. The miner wasn't a newbie himself; the rant was made on behalf of stunning rockchewer, allegedly the true owner of the Mackinaw. Agent Lament von Gankenheim heard the sorry tale while in a convo with devinebish. But rockchewer had yet to tell her side of the story. When rockchewer finally spoke up in local, she directed her anger at Agent Kalorned, who had been identified as the ringleader of the gank operation. Miners aren't very good at insulting New Order Agents. They don't understand our values. rockchewer was somewhat new to the game and still had a lot to learn (e.g., the Code). Despite her young age, she'd already absorbed the typical carebear arguments against ganking. In addition to claiming that gankers were lowering player retention, rockchewer pulled the "Without miners, you'd have no ships!" card. Carebear arguments are designed to be simple and easily distributed to an ignorant and lazy population. The downside: All those arguments are effectively countered by a well-trained Agent. And Kalorned was a well-trained Agent. The disturbance in local chat attracted the attention of curious onlookers. Would rockchewer get their sympathy or their scorn? Amamake is a notorious lowsec system known for its gate camps. For a bot-aspirant, though, every highsec system is an Amamake. It's not uncommon to see anti-Code folks saying that the New Order used to be worthwhile, but now it's bad. (Of course, we never heard from those people back in those halcyon days.) Actually, this is a positive thing: It means that a few years from now, people will say the CODE. of 2016 was good. Agents of the New Order, whatever you're doing right now, people will approve of it later. Another internal contradiction of the carebear philosophy: The Code has no value because it's player-made, but miners have value because they help make ships. To borrow from carebear logic, ore mined by other players is worthless; I only care about ore mined by CCP. To rockchewer's surprise, local opinion turned against her. The miner announced her intention to find safe haven in Gallente space, which she somehow already knew to be ganker-free. Maybe she should've gone there in the first place? Just before her departure, rockchewer indulged in fantasies about a carebear utopia in which "older players" sit around in highsec and protect the miners from gankers. The guy who lost her Mackinaw was an older player, so maybe rockchewer shouldn't rely on them so much. In the end, rockchewer and her patron were both left unsatisfied. They had excuses, anger, lies, and delusions--but they lacked the Code. She was so close to getting a refund! If only she had kept the faith! Does it need to be said? Anti-gankers, nonstop failing daily? Yes, yes they are! You know what they say code kills miners while antigankers kill minors. CHODE. slave Kalorned: "The vast majority of ore and minersals comes from dropped loot on rats"
First, what is a "minersal"? Second, please provide objective proof of your statement. picking up a tiny error because you have to cry about something. keep it up! Being banned from the game sure gives loyalanon a lot of time to debate AG on these forums. Thank God you have all this free time now. You can tell the grandkids all about your fierce forum posting. FIERCE! carebears and ag = rl thugs, liars, and murderers. Gank them all, let ccp sort 'em out. Fierce forum posting loyalanon. FIERCE! Sure beats playing EvE doesn't it? Keep up the hard work bud. As expected, the guilty parties received a heaping helping of Code goodness. Stunning Rockchewer was far less innocent than initially purported. She was poisoned against the Code before even getting established. I harbor doubts that she may have been devinebish's alt, because of the similarity in self-flattering naming, and because miners are known to speak from multiple accounts to try to sound more important. Will they never learn that the Code Always Wins? A story for the grandkids. Of course the second char was an alt of the first char, and not just because of the similar names. THERE ARE NO NEW MINERS. Let me explain. No one starts EvE to mine, they resort to mining after failing at EvE. EvE is different from the theme park mmo's they are used to playing, so when a real EvE player exposes the new player to the real EvE, most carebears cannot adapt, they run and hide in a hisec belt instead of taking the opprotunity to learn and participate. A very few actually have the ability to adapt and learn to play EvE correctly, the rest resort to pve in hisec. So all these "new" miners may have recent creation dates, but their carebear owners are not ignorant as to how EvE should be played. Their creation of new hisec carebear accounts are failed attempts to compensate for their inability to admit that EvE is too hard for them. They think that mining excessively and ruining the market with risk free ISK makes them 'good' at EvE. Well we all can see what that gets them. 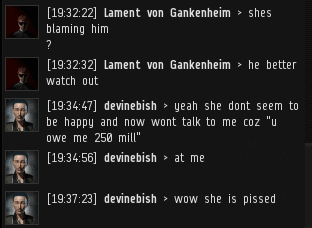 It's a shame that hisec failbears lack the intelligence to realize they dont belong in EvE, and that no one wants them here. Brilliant, Anon! That makes so much sense. I do wish you'd sign your posts in a more identifiable way. The best way to deal with this is for CCP to REMOVE ALL PVE from the game. All mining barges/haulers should be patched out. All hisec and lowsec should be converted to null. Ships and fittings should be seeded by CCP and EvE should run on subscriptions only. Thats the only way to get rid of all these whiney carebear shitlers. Everyone else will just pvp as usual. No, I will not be calm. No, I will not obey the code. Why do these WoW rejects insist on trying to carebear in EvE? The last great open pvp sandbox and all they care to do is afk mine. Thank goodness hisec gankers do what they do. In fact it's the duty of every player that cares about EvE to start a gank alt and send them into hisec to kill everything that smells like a carebear. We must put aside our faction and sov disputes and concentrate on removing all hisec carebears from the game. It's time for all real EvE players to unite and help save our beloved New Eden from the scourge of hisec carebearism. We can remove this cancer and make EvE great again! Why should we allow these vile creatures to ruin our economy? They dont play EvE, they log in just to ruin the game for real players. They are a threat to EvE and to CCP's financial future. Their toxic attitudes and deliberate misleading of new players is the reason for so many lost subscriptions. Will all CCP devs with CODE alts please pass this plea on to HQ. We could use your help in saving our game. These are desprate times! Fight or GTFO! In an earlier comments section the hisec failitia was asked why they post anon here but moderate their blog. But they never answered. Ima just copypasta it here again so they dont need to search for it, on the off chance that they have an answer. I got a question for the so-called hisec militia. Why do you not have an open forum on your blogsite, like this one? Why do you feel it is ok to post anon here, but then moderate your blog? CODE is an all-inclusive group, while ag is so very exclusive. The hypocrisy of ag, ingame and out, makes me believe they have something to hide. Dont believe it? Say something dissenting in their chats and watch how fast they call you a terrorist then kick you." the high sec failtila has a blog?